The company known as Singing Machine has revealed that there is a spanking new and upgraded version of their popular Bluetooth speaker which will be able to double up to be a karaoke entertainment system – calling it the Home 2.0 – which is an improvement over its predecessor, the Home. In fact, the Home 2.0 has been touted to be the perfect method of creating joy via music this coming holiday season, where it is capable of delivering up to hours of entertainment for friends, families and coworkers. The Home 2.0 will boast of improved Wi-Fi performance, enhanced sound quality, and extended battery life for the mic-remote. Sporting an asking price of $299 a pop, the Home 2.0 will be up for pre-sale at this point in time over at SingingMachine.com, where it will be able to make it in time for Christmas delivery. Not only that, those who prefer to rub shoulders with the rest of the people involved in some last minute, frenzied Christmas shopping can also opt to bring home the Home 2.0 from the likes of Walmart, althuogh one can also head on to the online sites of Walmart.com and Amazon.com later this month to get the job done, so to speak. 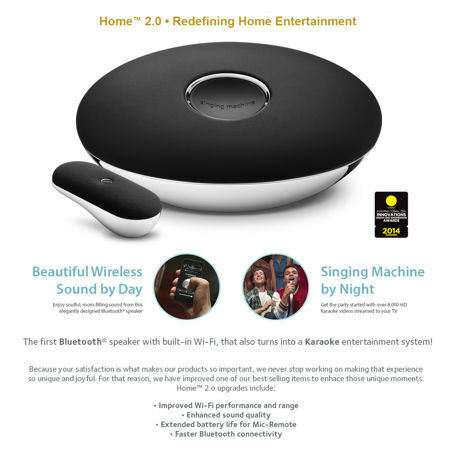 With Home 2.0, it is capable of delivering room-filling sound in the form of a Bluetooth speaker by day, while doubling up as an endless entertainment provider by virtue of being a karaoke entertainment system when dusk falls, all the way late into the night. Having said that, when the mood is just nice, the Home 2.0 can be transformed into an on-demand, Wi-Fi-enabled karaoke machine. You will be able to plug it into your TV through HDMI, where it is then connected to the cloud sans wires. A single click from thence would be able to let you gain instant access to Singing Machine Play, which so happens to be a platform which will be able to stream more than 8,000 HD karaoke music videos. Singing Machine Home 2.0 will also be accompanied by a wireless hybrid Mic-Remote which makes it a whole lot easier to navigate the Play platform on your TV. Users are also able to create their very own play queue online, where the Home 2.0 actually reimagines the traditional karaoke machine design through the addition of Bluetooth speaker functionality, while boasting of a sleek design that earns its place as a centerpiece in your home.